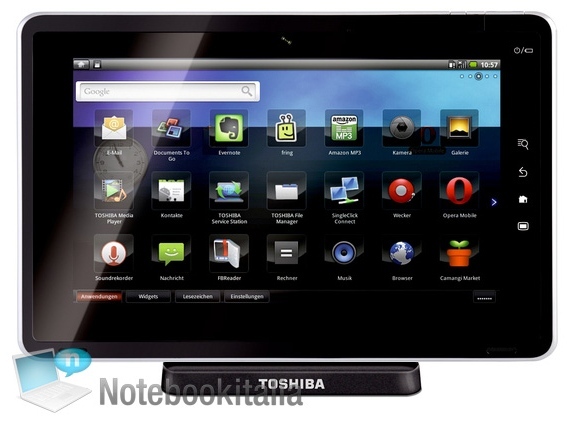 The Toshiba Android tablet that leaked earlier this week under the SmartPad name has been pictured again in much better detail, with Notebook Italia obtaining new photos of the tablet – along with a complete spec list. And it’s now called the Folio 100. This is a high-end model, it would seem, coming with a massive 10.1″ touchscreen that operates at a resolution of 1024×600, powered by a Nvidia Tegra 2 chipset. Android 2.2 is the OS, plus there’s an HDMI output and, of course, wi-fi and a USB connector. Who’d buy a tablet without a USB connector? Looks very nice indeed. That 10.1″ screen should give Samsung something to worry about, what with it set to obliterate the Galaxy Tab’s 7″ screen. Notebook Italia has more images of the Folio 100, including one of the machine’s docking station. See for yourself. Needs Market which I don’t think it has due to the screen res.